At a time of significant transformation in the retail industry worldwide, the newly opened Bensadoun School of Retail Management (BSRM) at McGill University will act as a hub in the heart of Montreal for students, researchers and practitioners to work collaboratively towards addressing the host of real-world challenges facing retailers today. An interdisciplinary, forward-looking school dedicated to all facets of the retail industry, its researchers will focus on fostering sustainable consumption and healthy societies. “The retail industry has seen unprecedented change in the last decade with the rise of e-commerce and the fall of formerly invincible category leaders. The School’s goal is to ensure the sustainable and prosperous future of the retail industry through research and education,” says Isabelle Bajeux-Besnainou, Dean, Desautels Faculty of Management. “We are living through a period of tremendous change in retail and to succeed, future industry leaders will need to fundamentally understand consumers’ changing behaviours and expectations. It is my hope that by working with industry partners and leveraging McGill’s breadth and depth of research in fields such as accounting and finance, as well as others like psychology, artificial intelligence, neuroscience and sustainability, we will succeed in reinventing the future of retail management,” says Aldo Bensadoun. The Bensadoun School and McGill are committed to equipping the next generation of retail leaders with the necessary tools and knowledge to address the industry’s transformation. A first cohort of students entered the Retail Management Concentration of the BCom program this fall. The PhD in Management with a specialization in Retail Management is set to admit its first students in the fall of 2019, and a specialized Masters of Management in Retail is scheduled for 2020. Executive Education is set to be launched in 2019 with both custom and open-enrollment offerings. 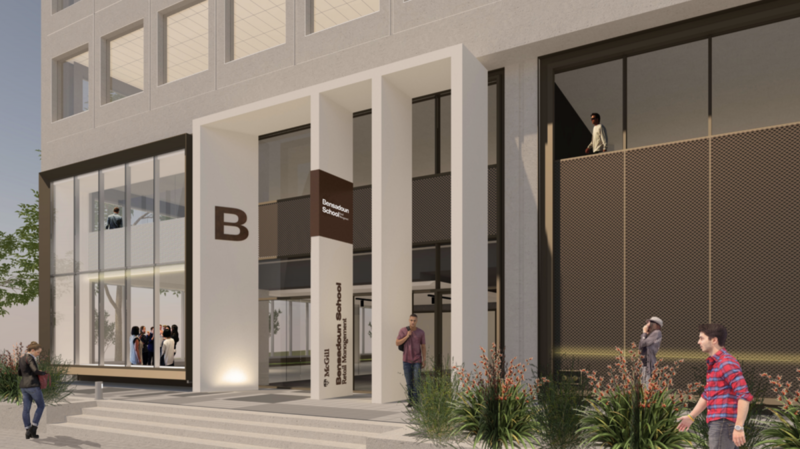 Following the $25 million initial gift from the Bensadoun Family Foundation in May 2017, retail- industry leaders have stepped up to support the School’s mission through the BSRM Founder’s Circle, which has raised over $7.5 million. Members of the Founder’s Circle include the Apparel Group, Couche Tard, Peerless Clothing, The Rossy Foundation, Saputo, Walmart, Ancapa GmbH (Stent-Torriani Family), CGI, Birks Group Inc. and CloudRaker. Other companies have expressed interest in partnering with the school for research, recruitment and educational purposes. Ivanhoé Cambridge and Nespresso will be signing on as some of the first BSRM “post-launch” collaborators. Along with education, research is at the heart of the BSRM mission. The main research areas in exploration include: Food, Health and Wellness, Fashion and Beauty, Financial Services and Financial Technology. "As a top-ranked international university, McGill is able to harness its significant research leadership and expertise in various disciplines such as neuroscience, computer science, engineering and design, health and sustainability, and link these to its resources in management and entrepreneurship”, says Saibal Ray, Academic Director and James McGill Professor, BSRM. “We aim to establish partnerships with key industry players to help define what the future of retail might look like. Through building an ecosystem of stakeholders focused on new retailing, we are ensuring that cutting edge research conducted at McGill finds applications on a global level." A key area of focus for the BSRM will be sustainability, which is central to the transformation of retailers’ practices and products. The Bensadoun School’s mission makes it well positioned to firmly establish Québec and Canada as an international centre for retail sustainability research and training. About the Bensadoun School of Retail Management at McGill University: Learn more about the BSRM. About McGill University: Learn more about McGill University.